The amount of food you buy and store will depend on the size of your kitchen and the number of cupboards you have. There's not much point in stocking up on trolley loads of special offer baked beans and pasta and then having to keep them in bags in the hallway where people will trip over them. Having said that, it's amazing what you can fit into even the most modestly sized kitchen. 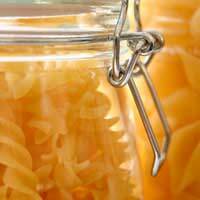 To help with storing your food away when you get home, you need to start at the beginning. Always go shopping with a list so you don't come back with things you don't need and forget the important stuff. Also, when you're at the checkout, try and pack your shopping carefully and put heavy items in the bottom of the trolley so more fragile foods don't get squashed. That's the shopping trip sorted out, now what do you do with it when you get home? Obviously all frozen food and most fresh produce should be put away in the fridge or freezer as soon as you get home from a shopping trip. Apples, bananas, citrus fruit etc should be kept in a fruit bowl, away from direct sunlight and the oven. If possible, keep your lemons separate from bananas, as the bananas will ripen more quickly if they're in the same bowl (although this is good if you've bought under-ripe fruit). Vegetables not stored in the fridge should be kept in a cool, dark place and used as soon as possible. They begin to lose their vitamin content as soon as they're harvested so the longer they're stored the fewer nutrients they'll contain. If possible, try to buy smaller amounts of veg on a regular basis. Vegetables that are freshly frozen keep their vitamins so it's a good idea to have some in the freezer as a standby. Again, put all your fresh or frozen meat in the fridge or freezer as soon as possible. Try to keep separate shelves for these at the bottom, if possible, and rotate any older items to the front so that these get used up more quickly than the food you've just bought. Another good tip is to separate packs of fish or chicken into separate pieces. It's very difficult to get one chicken breast out of a pack of four that's been in the freezer for a week. Instead, wrap them separately in cling film before you freeze them. Try to keep separate cupboards or areas for cereals; cans; oils, condiments and sauces; and rice and pasta, so it's easy to find everything you need when you're cooking. Tea, coffee and sugar are best stored in a cupboard over, or next to, the kettle, along with your mugs and cups. They should all be very easily accessible as these are the items that will get the used most often. Cans and dried goods are best stored at eye level so it's easy to find what you need. If you do have more space elsewhere, you can keep extra items tucked away and then top up the cupboards as required. Breadbins are a good idea for all your bread products. They help keep bread fresher for longer and stop crumbs getting all over the worktops. It's a good idea to keep rice and pasta in big clear storage jars - it's easy to see what you have and also stops eager penne or spaghetti strands escaping into the cupboard. Put a cloth or absorbent mat under oils and other jars. It makes it easier to clean the cupboard, as some oil will inevitably end up spilling. You can just put the cloth in the washing machine. So, now that your cans are neatly stacked in cupboards and your pasta sits proudly on the worktop you can sit down and have a cup of tea. All that effort will seem worthwhile when you get home from the pub desperate for a quick, filling meal.